1. Attach a three-way stopcock to the O2/CO2 flow regulator with a 5-cm section of 4.8-mm-I.D. tubing. Connect three T-shaped connectors end-to-end with 5-cm sections of 4.8-mm-I.D. tubing. Connect one L-shaped connector to one free end of the T's. Connect approx 2 m of 4.8-mm-I.D. tubing to the remaining free end of the T's for later attachment to stopcock-flow regulator assembly. Fig. 3. 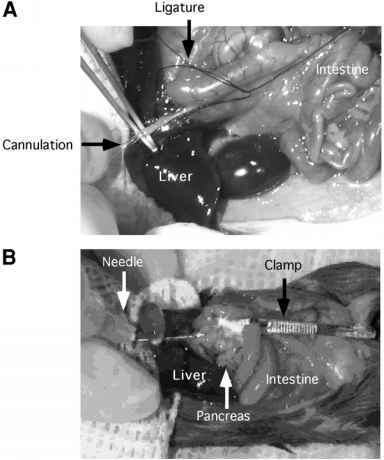 Perfusion of mouse pancreas in situ. (A, B) Diagrammatic representation of the blood vessel ligation in the mouse. 2. Attach a 5-cm section of 4.8-mm-I.D. tubing to each of three remaining T's and 1 L point. Remove the flange from the female point located opposite the male point on four three-way plastic stopcocks. Attach a stopcock, through its modified point, to each of the four free ends of the 5-cm sections of tubing. 3. Fit each end of four 30-cm sections of 1.6-mm-I.D. tubing with a male or female Luer-to-tubing connector. Attach the female Luer to the male point on each of the four stopcocks. Attach an 18 gauge X 15-cm pipetting needle to each male Luer-to-tubing connector. 4. Align a 30-cm section of support rod along the top of the manifold so that one end of the rod coincides with the closed end of the manifold. Secure the manifold to the support rod with glass-reinforced tape. Use a support stand to suspend the O2/CO2 manifold approx 30 cm above the water bath. 5. Prepare an identical O2/CO2 manifold, except use four blunted (90° cut) 18 gauge X 3.75-cm disposable hypodermic needles in place of the longer pipetting needles. Secure a 30-cm section of the support rod to the manifold, as before. Align the free end of the support rod along the 1.27-cm side of a 1.27 X 5 X 10-cm section of Plexiglas™ and secure with glass-reinforced tape. Using double-sided tape, attach the section of Plexiglas™ to the inside rear upper left corner of the perfusion chamber with the manifold directed toward the front of the chamber. 1. Attach two male and one female Luer-to-tubing connectors to a three-way stopcock and fit each connector with a 1.5-cm section of 1.14-mm-I.D tubing. Insert a 20-cm section of 1.8-mm-O.D./0.8-mm-I.D. tubing into the 1.14-mm-I.D tubing on each male Luer-to-tubing connector. 2. Partially bevel and polish two 15-cm pipetting needles. In addition, remove the hubs (90° cut) and polish the shaft. Attach the needle shafts (at the former hub end) to the free ends of the 0.8-mm-I.D. tubing using 1.5-cm sections of 1.14-mm-I.D tubing as connectors. The needle serves to guide the capillary tubing into the media bottles. 3. Insert a 40-cm section of the 1.8-mm-O.D. tubing into the 1.14-mm-I.D tubing on the female Luer-to-tubing connector. Attach a 3-cm section of double-sided tape to the rear of the stopcock assembly. Mount the assembly on the inside wall of the perfusion chamber above the area designated for media bottles. 4. Install 1.14-mm-I.D manifold pump tubing into the cartridge of the peristaltic pump and connect the inlet side to the free end of the 1.8-mm-O.D. tubing coming from the stopcock assembly. This step completes the assembly of the perfusion catheter leading from the media reservoir to the inlet of the peristaltic pump. 5. Connect the outlet of the manifold pump tubing to a female Luer-to-tubing connector. Flare each end of a 10-cm section of 0.51-mm-I.D. manifold pump tubing. Insert a male Luer-to-tubing connector into one end and a 65-cm section of 0.75-mm-O.D/0.25-cm-I.D. tubing into the other end. Connect the male Luer-to-tubing connector to the female Luer-to-tubing connector exiting the pump. This Luer-to-Luer connection is helpful when removing air and blockages from the tubing. 6. Partially blunt (90° cut removing approx 50% of the bevel) a 27 gauge X 31.25-mm hypodermic needle. Polish the end to a smooth and curved point. Remove the hub (90° cut) and polish the shaft. Insert the former hub end of the needle shaft into the free end of the 0.25-mm-I.D. tubing. This step completes the assembly of the perfusion catheter leading from the outlet of the peristaltic pump to the aorta of the mouse. 7. Cut a 45-cm-long piece of 0.51-mm-I.D/0.94-mm-O.D. tubing at 45° on one end. Leave the angled end of tubing on the platform. Guide the other end through a small hole in the center of right-hand wall of the chamber (approx 0.4 mm in diameter) and mount it onto a fraction collector. 1. On the day before perfusion, dissolve the desired amount of glucose (or any given stimulus such as arginine) in KRB-dextran and filter into fresh media bottles. Store at 4°C. 2. On the day of perfusion, place the media bottles fitted with the predrilled caps in the water bath, oxygenate the media by bubbling (0.5 mL/min) for 20 min with the 95% O2/5% CO2 mixture while the media equilibrate to 37°C. 3. After the media are oxygenated, add BSA (at a final concentration of 1% w/v) and dissolve by intermittent swirling to form perfusion media while maintaining an O2/CO2 atmosphere in the bottles (see Note 8). Attach blunted 18 gauge X 3.75-cm needles instead of 18 gauge X 15-cm needles to the manifold to prevent excess foaming. 4. Transfer up to four media preparations into the perfusion chamber and attach each to the O2/CO2 manifold using the blunted 18 gauge X 3.75-cm needles. Insert the two 18 gauge X 15-cm needle-capillary tubing leads from the stopcock of the catheter assembly into the first two media preparations to be tested (see Note 9). Maintain the O2/CO2 atmosphere in the media bottles throughout the experiment. 5. Prime (1.75 mL/min) and run the system with the first test preparation for 5 min after the tubing is free of air bubbles. Switch to the basal medium, prime, and run the perfusion system for 15 min after all the air is expelled from the tubing. 1. Anesthetize the mouse with an intraperitoneal injection of 80 mg Nembutal/kg body weight. 2. Place the mouse on the retractable platform overlaid with a 20 X 30-cm section of Saran Wrap™ and begin the surgery by opening an abdominal cavity. After a mid-line abdominal incision of the skin, the abdomen is incised from the pubic symph-ysis to the xiphoid process. 3. Ligate the superior mesenteric artery (Fig. 3A, ligature 1), splenic artery (Fig. 3A, ligature 2), and right renal arteries (Fig. 3B, ligature 3), using extra-delicate straight and slightly curved forceps and surgical suture. 4. Place two loose ligatures around the aorta, just below the diaphragm (Fig. 3A, ligature 4) and just below the level of the left renal artery (Fig. 3A, ligature 5). Then place the loose ligature around the left renal artery (Fig. 3A, ligature 6). Finally, place two loose ligatures around the hepatic portal vein; the first one is approximately 1.5 cm below the liver (Fig. 3B, ligature 7) and the second ligature is just below the liver (Fig. 3B, ligature 8). 5. Tie the ligature previously placed around the aorta below the diaphragm (Fig. 3A, ligature 4). Immediately cannulate the aorta with the 27-gauge needle held with forceps. Push the needle into the celiac trunk. Tie the second ligature previously placed around the aorta to fix the needle (Fig. 3A, ligature 5). 6. Using spring scissors cut the portal vein and cannulate it with the beveled end of the 45-cm section of silicone tubing (0.51 mm I.D./0.94 mm O.D.). 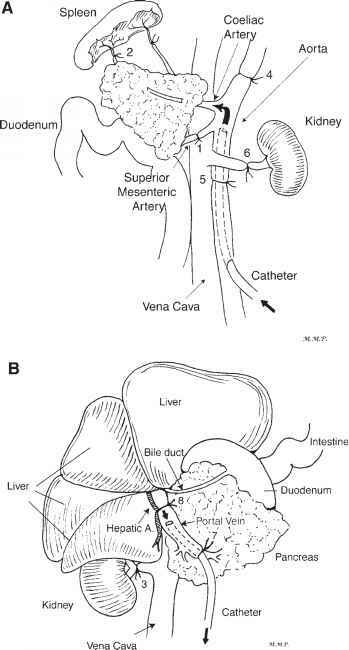 Tie the ligature previously placed around the portal vein (1.5 cm below the liver) to fix the catheter (Fig. 3B, ligature 7). 7. Tie the ligatures previously placed around the portal vein and hepatic artery just below the liver (Fig. 3B, ligature 8) and tie the ligature around the left renal artery (Fig. 3A, ligature 6). 8. Immediately kill the animal by cutting the diagram and heart. Wrap the body with the Saran Wrap™ to maintain the pancreas in a moist and 37°C atmosphere. 9. Adjust the flow rate. The ideal range for pancreatic perfusion is from 0.5 to 0.8 mL/min (7, 8). 10. Perfuse the pancreas with basal glucose medium for 30 min before collecting the timed fractions of the pancreatic effluent (see Note 10). 11. Immediately freeze the fractions of the perfusate at — 20°C. For long-term storage use —70°C.